Jean Millerat's bytes for good | Innover, Servir, Entreprendre ! Bridge My World = Wecena 2.0 ? De 2008 à un peu après 2012, j’ai essayé de mettre les informaticiens en intercontrat au service de la solidarité en développant un modèle économique original de mécénat de compétences. Ça a relativement bien marché, avec l’aide de gens extraordinaires : 8 associations bénéficiaires, 8 entreprises de services numériques mécènes, et le soutien d’Antropia, l’incubateur d’entreprises sociales de l’ESSEC et de la Caisse d’Epargne. Mais ça n’a pas suffisamment bien marché : impossible de mobiliser un flux suffisant d’informaticiens pour générer suffisamment de recettes pour faire décoller l’entreprise. Après 4 ans passés avec une portion seulement de mon salaire précédent, j’ai dû mettre la clef sous la porte et trouver une autre manière de faire de l’innovation numérique pour la solidarité (en devenant directeur de l’innovation du CNED). Au moment de fermer l’entreprise Wecena, j’ai appelé de mes voeux que le concept wecena puisse reprendre un jour, sous une autre forme, le wecena 2.0. Antoine et Joseph sont deux entrepreneurs sociaux qui se sont lancés dans l’aventure du volontariat humanitaire et veulent explorer la faisabilité de nouvelles formules de mécénat de compétences, peut-être sur intercontrats. Leur projet Bridge My World va-t-il représenter le wecena 2.0 ? Pour les aider, et aider tous ceux qui souhaiteraient trouver comment développer des formes durables de mécénat de compétences numérique sur intercontrat, je vous invite à trouver ci-dessous l’essentiel des supports de vente que j’utilisais pour développer le wecena 1.0. Je distribue l’intégralité de ces contenus sous licence Creative Commons-Paternité-Partage à l’identique (CC-BY-SA), ce qui vous autorise à étudier, utiliser, modifier et redistribuer vos propres versions de ces contenus, du moment que vous le faites sous la même licence et indiquant que j’en suis l’un des contributeurs (avec une mention « Jean Millerat » et/ou un lien vers https://www.akasig.org/). Cette entrée a été publiée dans Ecrit en français, Entreprises responsables, Humains en réseaux, le wecena, Mécénat, My wishlist le 16/11/16 par Jean Millerat. The blockchain technology underlies crypto-currencies such as a bitcoin. But its power goes far beyond currency trading, money transfer and purely financial applications. Many idealist pragmatists want to change the world using the blockchain technology. Here is my attempt at listing projects and applications which aim at making some social impact using blockchains. Please don’t hesitate to drop me an email (sig at akasig dot org) or post a comment below if you know of other applications of the blockchain technology for social good ! The blockchain might make « the world’s unbanked a viable new market » , « bring banking to the underserved »… There are drafts of smart contracts being hacked for blockchain-based universal bankind accounts at CommonAccord. Their interview on the French radio BFM explains their project (minute 24.21). Caricoin launched a mobile bitcoin wallet in order to provide banking services to the unbanked in the Caribbean, about 50% of the population in some areas there. It is the first pan-African blockchain-powered payment network. After careers in finance, technology and development, the founding team saw opportunity in emerging blockchain infrastructure to reduce business-to-business and peer-to-peer payments from 12-20% to 3%, putting money back into the pockets of businesses and individuals who are now able to save and invest more back into the economy as a result. Bill Barhydt, founder of Abra, is a veteran of the cross-border money remittance sector. He saw firsthand the inefficiencies created by multiple intermediaries including Western Union and banking institutions, which extract significant fees for small transactions. With emerging markets rapidly adopting smartphones, Bill saw opportunity in enabling local agent networks in these markets with a blockchain powered app that would reduce fees for the sender and recipient, and provide agents with access to a broader customer base. Launched in 2015 at the Launch Festival (where it won Best Startup), Abra is now live in the Philippines with additional markets to be announced in 2016. WeiLend implements a peer-to-peer lending contract. Duniter is another implementation of a Group Currency and blockchain-based universal income. Johan Nygren’s resilience.me and basicincome.co were an early attempt which has gone nowhere beyond generating some welcome buzz and public awareness (at least it seems to me). The introductory video of the « Learning is Earning 2016 » concept by the Institute for the Future develops an ambitious and controversial vision of the use of blockchains for education and lifelong learning. Badgechain is an open community of open badge enthusiasts discussing uses of blockchains for education. The Sony Global Education division of the company has developed technology that uses the blockchain to house educational data that can be securely shared with other services and third parties. OTLW was founded in Kenya (Kenya and blockchains with social impact, once again…) and proposes otlw-assess, a blockchain-based system for secure universal assessment of skills and knowledge and otlw-publish, a system for facilitating the distribution of micropayments to authors of (educational?) documents, I guess from persons citing their documents. Several universities use blockchains to authenticate the deliverance of degrees or other academic certificates : University of Nicosia, MIT Media Lab, Holberton School as well as the Ecole Supérieure d’Ingénieurs Léonard de Vinci. Grid Sindularity is a decentralized energy marketplace and energy data exchange platform. TransActive Grid is also a blockchain-based energy marketplace but it focuses on local peer-to-peer home-produced energy trading, not unsimilarly to DAJIE and its blockchain-connected energy boxes (except maybe DAJIE’s community is not necessarily local ? I don’t know). The French Lumo and its Solarcoins allow consumers to invest in the shared production of renewable energy. Lumo recently plugged into the ElectricChain which shares solar energy data on the blockchain from 7 million solar facilities, for scientific and commercial purposes. Solether is like a Cash machine but it distributes electricity from its solar panel (for instance when you want to charge to mobile phone) in exchange for blockchain payments, instead of distributing cash. ClimateCoin incentizes the offsetting of carbon emission by letting donors and carbon emitters to give ethers to persons who plan trees or reduce CO2 emissions in other ways, in exchange of public and secure carbon offset receipts. decibel.LIVE incentizes local businesses to reduce the level of ambient noise they are making in the neighborhood by letting them earn public and secure receipts of noise reduction from local mobile phone users who monitor ambient noise from a blockchain app on their phone and receive micropayments in compensation for their monitoring. La’Zooz and Arcade City aim at developing ridesharing and uberizing Uber by not having to trust any central party be it a taxi company or Uber. MyHealthIRL provides « health wallets » which gives your control over your health records (including their sharing and privacy) and facilitates second medical opinions for instance. TrustlessPrivacy seems to aim at the same target. PointNurse is a web and mobile nursing platform empowering healthcare providers (nurse practitioners, medical doctors, …) to provide online consultations and support for patients. Payments and health data sharing seem to be secured on a blockchain as well as sharing of the profits generated by the platform, hence its promise of being « member-owned ». EyePi is a blockchain-based platform that allows pharmaceutical laboratories or other actors of the health industry to outsource and « crowdsource » health-related innovation and research challenges to third parties and guarantee that these innovators and researchers are fairly rewarded. The U.S. Department of Health and Human Services launched a (non-blockchain-based) contest for innovators to propose use cases of blockchain technologies within the healthcare industry before August 2016. ImpactGrid is a blockchain-based smart investing platform and marketplace. It is to provide a transparent and secure solution for measuring and reporting social impact and to allow users to invest in the most impactful social innovations. This project is led by the Indian Investrata Foundation for Social Entrepreneurship. The UBS bank runs experiments on a blockchain-based experimental trading platform. UBS gave some of its experimental code to Finclusion Lab, a London-based fintech social enterprise, to develop a blockchain platform for the HEAL Alliance, a non-profit project looking into a cure for HIV. Using this platform, the HEAL Alliance wants to issue smart social impact bonds for raising funds for HIV research and letting people trade bonds in order to allocate most funds to the most promising cures. Incentive schemes, whereby people who have done the most good for humanity are rewarded 20 years into the future would create the expectation that doing long-term good is valuable. Several blockchain-based software projects want to create secure and fully auditable online voting platforms : FollowMyVote, PublicVotes, V-Initiative, DemocracyOS to some extent, … The main drawback of current (non-blockchain-based) online voting software is that they are most often not open to public scrutiny to ensure the accuracy of the voting system. Ballots have to be verifiable. Blockchains bring an advantage of verifiability to online voting systems. DCent is research project funded by the European Union (7th framework programme). It develops an open-source, distributed and privacy-aware tools for direct democracy. Deloitte sees in blockchains an opportunity for periperal countries to reduce losses due to corruption, bribery, thief and tax evasion while Provenance sees an opportunity for consumers to make companies more accountable for the impact their products have on the environment and local communities. Provenance allows consumers to learn about a product’s journey along its supply chain. In order to limit corruption and enhance public transparency, several projects aim at building public ownership registries on top of blockchains without the help of third parties such as notaries and cadastre surveys. ProofOfExistence proves a given document existed at a given date and NotarEth provides a basic blockchain-based notary service : it proves you had access to a given set of documents at a given point in history. BitLand registers land ownership in Ghana. Regis is public blockchain application for registering ownership of digital assets. It is used by, among others, the BVRio Institute to protect the Brazilian rain forest by registering timber trading records. And Brian Singer, from the William Blair investment firm, explains how blockchain-based public registration of ownership will solve poverty. It looks as if blockchain innovators were reinventing registry services, notary services and other legal services in a trustless and automated world which seems somehow ignorant of existing « local » laws and « dumb » contracts. How to bridge this gap between blockchain-based services and local laws ? CommonAccord « creates global codes of legal transacting by codifying and automating legal documents, including contracts, permits, organizational documents, and consents ». It offers a collaborative platform for turning existing legal documents into source code for automateable smart contracts on blockchains. See for instance this French employment agreement or the Paris agreement on climate change. New businesses come with new risks. Case Wallet and Civic provide blockchain-based identity protection services against identity theft and fraud. Civic offers identity theft insurance. Regarding more traditional risks, many insurance startups invest on blockchains. Dynamis provides supplemental unemployment insurance. InsurEth provides flight insurance. Wekeep provides (undefined yet?) mutual insurance services. Others provide infrastructure software for blockchain-based insurance : Allied Peers is an insurance software engine and Dactuary decentralizes actuary services. FarmShare implements a distributed « community-supported agriculture » platform which lets farmers share benefits of food production and risks such a low crop yield, environmental abuse or even some form of social abuse. Even the UK government gets into the party by trialling the Blockchain for Welfare & Pensions. The blockchain revolution has just begun and decentralized applications for social impact and social innovations are just emerging. Most social entrepreneurs come for traditional non-profit management or business schools and it make take some time for them to grasp the potential benefits of blockchain technologies over traditional web and mobile technologies. For more socially impactful applications of blockchain technologies, I am looking forward to reading about the ideas being collected by the Blockchain Social Impact Challenge. Other useful sources of news to keep an eye on are the State of the Dapps site and the Social Tech Guide. Please comment below if you know of other dapps having a great potential in terms of social impact or drop me an email (sig at akasig dot org) in case the comment section below is closed and I will update this article. Cette entrée a été publiée dans blockchain, Entreprises responsables, Humains en réseaux, Informatique, Innovation, written in English le 28/07/16 par Jean Millerat. Mais, au-delà de ces communautés technologiques, ce principe du « crowd sourcing » et des communautés open source s’est étendu. Ce sont tous les internautes qui ont été invités à contribuer au sein de communautés ouvertes et en ligne. Par exemple, la communauté Wikipedia est riche de plus de 20 millions de contributeurs (dont 70 000 actifs tous les mois) qui écrivent et tiennent à jour une encyclopédie de plus de 38 millions d’articles, consultée par 374 millions de lecteurs par mois. La communauté OpenStreetMap, riche de plus de 2 millions de contributeurs, a cartographié plus de 3 milliards de repères géographiques et 300 millions de routes et chemins dans le monde entier. Et ses cartes sont utilisées par plus de 20 millions d’utilisateurs chaque mois. Des équipes de professionnels de l’humanitaire utilisent ces cartes pour mieux coordonner leurs interventions d’urgence en cas de catastrophe naturelle (séismes, inondations, ebola, …). Des militants l’utilisent pour mieux cartographier des événements majeurs tels que conflits armés ou manifestations. Des personnes handicapées l’utilisent au quotidien pour préparer leurs déplacements et connaître l’accessibilité des trajets jusqu’aux lieux publics ou privés auxquels ils souhaitent se rendre. 2017. Thomas a 19 ans. Avec un bac STMG en poche, il aimerait travailler dans la banque, pas forcément comme trader même si ce serait son rêve, mais peut-être en tant qu’assistant commercial. Il ne sait pas trop. Pour l’instant, il fait son volontariat, en tant que volontaire numérique. Il a commencé il y a quelques semaines déjà. Il est content : cette semaine encore, il est dans la même équipe que Léa, Nathan et Alexandre. Il sort tout juste du McDonald’s où s’est déroulé le planning hebdomadaire de l’équipe. Son objectif personnel, pour cette semaine, c’est d’atteindre le niveau 3 en cartographie humanitaire. Et l’équipe a estimé pouvoir s’engager à atteindre un score de contribution de 380 points d’ici vendredi soir. C’est l’objectif collectif de la semaine. Thomas est rentré chez lui. Sa mère le laisse contribuer tranquille sur son ordinateur perso. Mais il pense qu’il va plutôt aller contribuer chez Nathan cet après-midi, pour qu’il lui explique comment on utilise le wiki pour la cartographie humanitaire : c’est en anglais et l’anglais, ce n’est pas le fort de Thomas… De toute façon, le wifi chez Nathan est bon aussi. Le seul problème, chez Nathan, c’est son abonnement Netflix… Plutôt tentant. Mais il sait que Léa, l’animatrice de l’équipe, elle aussi volontaire mais en fin de service, veille au grain et vérifiera sa production du jour sur openstreetmap : il n’a pas trop intérêt à traîner, il n’a pas envie de perdre des points d’expérience en cartographie comme l’autre jour. Thomas se connecte au slack de l’équipe et met son casque. Nathan est déjà connecté (il habite en face du McDo…) et tchatte plutôt de contribuer. » Nathan, bouge-toi si tu tiens aux 380 points de la semaine ! » Nathan répond à Thomas » Check-moi plutôt 1A755D8978FECAA24 « . Thomas hausse les épaules et saisit le code du jour de Thomas dans le formulaire de pointage de l’équipe. Thomas copie-colle dans le tchat son propre code de pointage du jour, pour que Nathan puisse à son tour attester de sa présence en ligne. A chaque heure, c’est l’appel et on a que 10 minutes pour copier-coller les codes de chacun. C’est parti pour la carto humanitaire niveau 3. Où est le lien de la grille de l’Afghanistan ? Le voila… Thomas choisit la case C32 de la carte : aucun volontaire ne s’en est occupée jusqu’ici. L’image satellite affiche un paysage désertique et montagneux. La rivière qui traverse la case C32 est bien visible. Thomas clique à chaque coude de la rivière pour la tracer en bleu sur le fond de carte. Tant qu’il y est, il poursuit le tracé de la rivière sur les cases C33 et D33. De temps en temps, il valide son tracé et enregistre dans le formulaire de l’équipe le lien de son nouveau tracé : autant de points qui vont faire grimper le score de l’équipe. Léa leur a expliqué que les inondations de l’an dernier ont été terribles. Et l’une des équipes d’urgence du Croissant-Rouge n’avait aucune des rivières de cette province sur ses cartes, ce qui a considérablement retardé l’aide aux populations des villages les plus touchés. C’est pour ça que la communauté mondiale des cartographes bénévoles « OpenStreetMap » a mis en place ces outils de contribution pour volontaires en ligne. Depuis le séisme d’Haïti en janvier 2010, une équipe de professionnels de l’humanitaire s’est même associée aux cartographes bénévoles pour coordonner les efforts, de manière à en maximiser l’impact sur le terrain. Il parait que des bénévoles sont en train de mettre au point des drones pour accélérer la cartographie de terrain en cas de nouvelle catastrophe naturelle. Déjà 1 heure passée à tracer les détours de cette rivière du bout du monde. A ce rythme là, si toute l’équipe s’y met, les 380 points devraient être largement dépassés d’ici vendredi. Mais il est déjà 11H. Nathan a fait 3 blagues douteuses dans le slack. Chacun y va de son « lol » poli. On dirait que Nathan a compris : ses blagues ont changé de registre. Thomas vérifie son emploi du temps : aujourd’hui, 11H, c’est transcription ! Chacun colle son nouveau code de pointage, pour répondre à l’appel. Thomas et la plupart de ses équipiers doivent maintenant sous-titrer une série de vidéos humoristiques pour permettre à des internautes sourds d’en profiter. Thomas a compris le projet, la dernière fois pendant la séance de découverte. Mais il n’a pas encore entièrement compris comment utiliser la plate-forme de sous-titrage : il commence juste le niveau 1 en transcription. 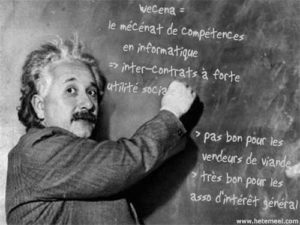 Alors il se connecte au wiki de formation des contributeurs et reprend le tutoriel là où il en était. Il lance la vidéo du tuto et reconnaît la voix et le bureau virtuel d’Alexandre. Alexandre explique d’une voix monocorde où et quand il faut cliquer sur les différents boutons pour contrôler le défilement de la vidéo et saisir les sous-titres. Décidément, Alexandre n’est pas fait pour devenir commentateur sportif, ni commentateur d’enregistrement vidéo d’ailleurs… Thomas se dit qu’il faudra qu’il lui fasse un tutoriel sur comment parler avec enthousiasme dans un tutoriel vidéo (Thomas est de niveau 4 en enregistrement de tutoriels). Bref. Thomas écoute attentivement Alexandre, répond au quiz, se connecte à la plate-forme de transcription et s’exerce sur une vidéo d’exemple. Il colle dans le formulaire à la fin du tutoriel le lien vers son essai de transcription, dans l’espoir qu’Alexandre vienne l’évaluer d’ici peu et lui valider sa compétence de sous-titrage. Il reste un peu de temps d’ici le déjeuner. Thomas en profite pour se connecter à l’historique des contributions du matin. Il voit les liens de contribution cartographique de son équipe mais n’a pas le droit de l’évaluer. Il ne serait pas très objectif : c’est son équipe, après tout. Alors il clique sur le tracé cartographique d’une certaine Manon… Manon a saisi les noms de toute une série de villages afghans en les recopiant à partir d’une vieille carte de la CIA. Thomas vérifie 3 ou 4 noms de village. Ils sont conformes à ce qui est écrit sur la carte. Thomas donne un like à Manon. Un point de plus pour l’équipe de Manon, en tant qu’évaluée. Et un point de plus pour l’équipe de Thomas, en tant qu’évaluateur. Ce soir, il se dit qu’il aura des chances de rêver de sourds afghans de la CIA qui nagent dans des rivières lactées sans conservateur… Espérons qu’il dorme bien : demain matin, Thomas est invité dans une banque du quartier pour expliquer aux employés ce en quoi consiste le volontariat pour la solidarité numérique (eux aussi peuvent apprendre à contribuer). Avec un peu de chance, il fera la connaissance du directeur de l’agence. Le volontariat numérique s’effectue en équipes de 4 à 8 volontaires. Les volontaires se retrouvent en présence au moins une fois par semaine, dans un lieu associatif ou public avec du wifi (café, fast food) ou chez l’un des volontaires, selon leur préférence. Le reste du temps, ils travaillent à distance, depuis un ordinateur personnel connecté en haut débit. Pour devenir volontaire numérique, il faut donc disposer d’un ordinateur personnel, d’une connexion haut débit (ADSL, …) et savoir utiliser sans difficulté la messagerie électronique, le Web, les réseaux sociaux (Facebook, …) et la conférence à distance par webcam (Skype, …). Le volontariat est organisé selon un emploi du temps individuel très contraint. Au cours d’une journée, à chaque heure, chaque volontaire contribue à l’un des 10 projets ouverts. En fonction de son niveau d’expérience dans les différents rôles proposés par ce projet, il doit contribuer en suivant des consignes précises. Chaque contribution laisse des traces numériques (un lien hypertexte) que le contributeur vient coller dans la liste des contributions de son équipe. Ses contributions sont évaluées par des volontaires d’autres équipes. Et, s’il a le niveau requis en compétence d’évaluation, il peut évaluer les contributions d’autres équipes. Chaque projet permet différents types de contributions en ligne : des contributions les plus simples à celles nécessitant le plus de compétence et d’expérience dans le projet. Chaque type de contribution de chaque projet peut s’apprendre via une autoformation en ligne ou auprès d’un volontaire plus expérimenté et reconnu comme formateur compétent. Chaque volontaire dispose d’un profil de compétences pour chaque projet. Chaque équipe de volontaires est animée par un volontaire plus expérimenté qui a réussi à apprendre le rôle d’animateur. Chaque projet dispose de formateurs reconnus, eux-même formés par des volontaires jouant le rôle d’instructeurs. Certains instructeurs sont devenus concepteurs de formations ou bien ambassadeurs. Les ambassadeurs gèrent les relations entre les volontaires et les communautés ouvertes d’internautes bénévoles à l’origine des projets (par exemple la communauté wikipedia, la communauté openstreetmap, …). Tous les volontaires ont également un rôle d’ambassadeur du numérique, auprès de leur quartier (associations, établissements scolaires, lieux publics, entreprises) pour faire découvrir le bénévolat numérique et faire contribuer ponctuellement le plus grand nombre possible de personnes sur des tâches numériques d’intérêt général très simples. Parmi 1 000 volontaires numérique, on peut compter 800 volontaires faisant principalement office de contributeurs sur les divers projets, mais aussi 160 volontaires jouant le rôle d’animateurs d’équipes, 32 volontaires agissant comme formateurs, 6 volontaires concepteurs de formations et 2 ambassadeurs servant d’interface avec les communautés d’internautes. 1 personnes : direction de projet, stratégie technologique et managériale. Cette entrée a été publiée dans Ecrit en français, Humains en réseaux, Innovation, le wecena, My wishlist, Open source le 11/04/16 par Jean Millerat. Here is their HOWTO documentation. I share it under the Create Commons CC-BY-SA 3.0 license so feel free to improve it as you like. Cette entrée a été publiée dans Développement, Informatique, Innovation, Open source, written in English le 14/03/16 par Jean Millerat. Un lab pour que l’État démocratise les blockchains ? et pour renseigner nos gouvernants et hauts fonctionnaires sur les menaces et opportunités liés à cette technologie ainsi que ses capacités et limites réelles. La Caisse des Dépôts et Consignations a récemment annoncé la création d’un groupe de travail sur ce thème (voir aussi leur communiqué de presse). Développer ce genre de laboratoire serait une aventure passionnante au service de laquelle je souhaiterais mettre mes compétences professionnelles. La « blockchain » est la technologie sous-jacente aux cryptomonnaies telles que Bitcoin. Le caractère monétaire, plus ou moins intraçable et anonyme, de Bitcoin n’a qu’une importance anecdotique. Sa technologie sous-jacente est, elle, révolutionnaire. Une blockchain est un ordinateur mondial unique qui, au lieu d’être installé dans un immense hangar spécialisé, est installé de manière « distribuée » sur les millions d’ordinateurs et smartphones des utilisateurs qui l’exécutent tous ensemble, simultanément en se coordonnant les uns avec les autres de manière automatique via Internet. Comme tout ordinateur, un ordinateur « blockchain » exécute des applications logicielles. Les premières blockchains, telles que celle de Bitcoin, permettaient principalement d’exécuter des logiciels de transaction financière entre utilisateurs (« Alice transfère 1 bitcoin à Bob »). Mais les blockchains plus récentes, comme celle d’Ethereum, permettent d’exécuter des applications multi-utilisateurs aussi complètes que celles auxquelles nous ont habitués nos ordinateurs et smartphones. A la différence d’un ordinateur ou d’un smartphone habituel, une blockchain, en pratique, ne peut pas être éteinte ni piratée : il ne s’agit pas d’une infrastructure informatique entre les mains d’une personne, d’un groupe d’individus ou d’un opérateur mais d’un ordinateur virtuel unique ultra-sécurisé car s’exécutant simultanément sur des millions d’ordinateurs. Si quelques-uns des ordinateurs participants viennent à « tricher » ou défaillir, ils sont automatiquement détectés par les autres et leurs déclarations sont rejetées. Étant donné qu’une blockchain est un ordinateur multi-utilisateurs, on qualifie ses logiciels de « contrats intelligents » (« smart contracts ») ou contrats algorithmiques auxquels souscrivent ou non les utilisateurs qui le souhaitent. Un utilisateur de blockchain est un souscripteur de contrat algorithmique. Contrairement à un contrat traditionnel, les contrats algorithmiques apportent une garantie mathématique d’exécution : étant donné qu’il s’agit de logiciels sur un ordinateur que nul ne peut éteindre ni compromettre, ces contrats seront exécutés tels qu’ils ont été écrits (avec leurs éventuels bugs de conception), sans échappatoire possible. La blockchain est donc une technologie sociale qui permet de conclure et d’exécuter des contrats entre personnes dans des conditions de sécurité telles qu’elles rendent inutile de faire confiance aux contractants ou à un tiers de confiance, à un magistrat ou un arbitre, pour en obtenir l’exécution prévue. On parle de technologies « sans confiance », c’est-à-dire qui permettent de s’exonérer de tout tiers de confiance. En résumé, la technologie des blockchains, sous-jacente à Bitcoin et aux autres cryptomonnaies, redéfinit la manière dont se régulent certaines relations sociales. La blockchain rend possible des relations contractuelles (y compris des contrats de propriété) tellement sûres qu’elles rendent inutiles les tiers de confiance et les arbitrages humains habituellement requis pour la garantie d’exécution d’un contrat. La décision humaine intervient lors de la conception du contrat et lors de sa souscription. Mais elle n’intervient plus lors de son exécution. A titre prospectif, voici un scénario d’évolution des blockchains qui suit la même logique historique que celle de la démocratisation de l’Internet et du Web. D’ici 2018, la technologie des blockchains, jusqu’ici réservée aux spécialistes des cryptomonnaies et autres cryptanarchistes gagnera en maturité au point d’être utilisable facilement par l’ensemble de la population. A partir de 2018, la blockchain connaîtra une démocratisation de même envergure que celle du Web dans la deuxième moitié des années 1990. 1993 = début de la démocratisation du Web avec le premier navigateur Web multimédia « NCSA MOSAIC » 2018 = début de la démocratisation des blockchains avec les premières applications mobiles d’utilisation de de contrats algorithmiques. Les blockchains vont être appliquées dans tous les domaines où la sécurité économique est importante et où les tiers de confiance sont traditionnellement présents. Elles redéfiniront le rôle des intermédiaires financiers et contractuels (phénomène de désintermédiation). sécurisation des registres, certificats et actes administratifs : gestion du cadastre (cf. les intentions exprimées au Ghana et au Honduras), transformation numérique des métiers notariaux, sécurisation des actes juridiques, sécurisation et ouverture des registres du commerce, des listes d’organismes agréés, des diplômes et certificats de compétences, etc. émergence de la propriété collaborative (« smart property ») dans la continuité des AirBNB et autres Uber. émergence des premières D.A.O. (Distributed Autonomous Organizations), organisations gouvernées sans intervention humaine : banques sans banquiers, assurances sans assureurs, mutuelles sans administrateurs, sociétés privés sans gérants ni conseils, associations sans conseil d’administration, partis politiques sans bureaux politiques, complexes logiciels et intelligences artificielles restreintes. Les applications à long terme, d’ici 10 à 20 ans, donneront toute sa dimension à la révolution blockchain. En particulier, la société sera marquée par de nouveaux sentiments identitaires d’appartenance à des communautés fondées sur des contrats algorithmiques. Après la tribu ou la famille, puis la nation et la société privée, les contrats algorithmiques créeront une surcouche de régulation sociale au travers de communautés contractuelles transnationales, concept exploré par plusieurs auteurs de science-fiction de style « cyberpunk » ou « steampunk » comme par exemple les « phyles » de Neal Stephenson (L’Âge de Diamant). A court terme, la technologie des blockchain annule une part croissante de la valeur ajoutée de tout ou partie des tiers de confiance, en les rendant inutiles et obsolètes. Le phénomène est à rapprocher de la manière dont le Web a annulé une partie de la valeur ajoutée des distributeurs de contenus culturels, ce qui avait entraîné la crise de l’industrie du disque et de la presse. Les blockchains transforment la confiance contractuelle en une matière première faiblement différenciatrice, dont tous les opérateurs économiques peuvent disposer à faible coût, sans pouvoir y construire un avantage concurrentiel durable. En banalisant (commoditization) la technologie des opérateurs et tiers de confiance, la blockchain détruit les rentes des « intermédiaires » de confiance et déplace les gisements de valeur ajoutée vers une « couche technologique » plus élaborée : celle des applications et usages des blockchains. Ce faisant, elle crée un phénomène d’ « innovation de rupture » qui érode les parts de marché des opérateurs traditionnels « de confiance » (banques, assurances, mutuelles, professions réglementées de la confiance, voire administrations) et les acculera progressivement vers des niches à plus forte valeur ajoutée mais à plus faible volume, jusqu’à les faire disparaître. Le périmètre exact des industries concernées reste à préciser. Les innovation de rupture permises par la blockchain permettent à de nouveaux acteurs de concurrencer ces opérateurs traditionnels sur leurs segments « bas de gamme » qu’ils leur délaisseront progressivement au fur et à mesure que les applications des blockchains gagneront en maturité, en simplicité, en praticité et donc se démocratiseront. Les nouveaux acteurs des blockchains proposeront des offres « sans tiers de confiance » tellement simples, pratiques et peu coûteuses qu’ils y donneront accès pour des segments de clientèle très nombreux, très volumineux et jusqu’ici exclus du marché des applications traditionnelles de la confiance contractuelle. On devrait, par exemple, voire émerger des offres de services bancaires sans banques, de crédit sans organisme de crédit, d’assurance sans assurance, de mutuelles sans mutuelles, de notaires sans notaires, d’huissiers sans huissiers, pour des contrats simples, pratiques et peu coûteux jusqu’ici hors de portée des particuliers. On peut d’ailleurs constater les prémisses de ce phénomène à travers l’émergence des prêts entre particuliers. Des excès de la financiarisation ou de l’ubérisation de l’économie sont à craindre. Mais des innovations sociales solidaires de très grande ampleur sont également à espérer. A plus long terme, l’administration et les services publics sont directement concernés. En effet, l’administration publique a aussi une raison d’être qui est de nature économique : celle d’offrir aux citoyens des services publics dans le respect de l’intérêt général et avec un haut niveau de confiance, celui inspiré par la puissance de l’État et sa capacité régalienne de violence (police, justice, prison, armée). Supposons que les citoyens puissent commencer à obtenir des services similaires en souscrivant à des contrats algorithmiques et que les preuves mathématiques d’exécution de ces contrats, offertes par leur nature algorithmique, leur inspirent davantage confiance que l’État (qui est plus fiable : les mathématiques ou les États ?). Alors ils se tourneront progressivement vers ce nouveau mode de régulation de leurs relations, meilleur garant de l’intérêt général que l’État. Leur qualité de souscripteur pourrait prendre plus d’importance à leurs yeux que leur qualité de citoyen. Jusqu’à il y a peu, l’État exerçait une sorte de monopole sur la défense de l’intérêt général, monopole déjà largement érodé par le développement du secteur associatif et celui, plus limité, du mécénat privé. Mais rien n’empêchera désormais un collectif de personnes d’écrire un contrat algorithmique défendant la vision de l’intérêt général à laquelle ils souscrivent (leur politique), d’y souscrire et d’y trouver un substitut pratique aux services publics avec toute la confiance mathématique conférée par la nature algorithmique de ces contrats. Et si les citoyens, plutôt que d’espérer changer le monde par le débat démocratique et le vote, se mettaient à vouloir changer de monde en souscrivant à des contrats collectifs reflétant leurs valeurs et leur vision politique ? Et si l’État, prenant les devants, proposait des applications blockchain et des contrats algorithmiques incarnant les valeurs et principes de notre démocratie et promouvant l’intérêt général, tout en laissant au citoyen la possibilité d’y exprimer ses besoins et aspirations individuelles ? Et si on mettait les blockchains au service de l’État, de l’intérêt général et de l’innovation sociale ? Cette entrée a été publiée dans Architecture, blockchain, Ecrit en français, Entreprises responsables, Humains en réseaux, Informatique, Innovation, Mécénat, My wishlist le 17/02/16 par Jean Millerat. La banque suisse UBS vient de faire don à une ONG britannique du code source pour un logiciel qui permettrait de financer la recherche médicale contre le SIDA. J’ai lu en diagonale alors n’hésitez pas à corriger/compléter/commenter mon propos vis les commentaires ci-dessous… Ce que je comprends : l’originalité de ce logiciel financier, c’est de mettre l’intérêt privé (une banque suisse…) au service d’une innovation d’intérêt général (trouver un médicament pour guérir le sida). Pour ce faire, le logiciel permet d’automatiser des transactions financières appelées « Social Impact Bonds », une forme d’« obligation » privée dédiée au financement de l’impact social. L’intérêt principal de ce logiciel est de sécuriser des collectes de dons provenant de collectivités publiques ou de particuliers (les souscripteurs de ce contrat d’obligation) ainsi que l’intervention des banques. Le principe de fonctionnement ressemblerait à ceci. Les investissements privés des banques servent à payer les laboratoires de recherche sélectionnés pour l’exécution de ce contrat. Si jamais un médicament est trouvé dans les 25 ans, alors les dons des particuliers ou des Etats vont rembourser les investissements des banques (avec intérêts). Si jamais aucun médicament n’est trouvé par les chercheurs, alors les dons des particuliers et des Etats leurs sont remboursés (sans intérêts) pour qu’ils puissent financer d’autres projets alors que les banques auront perdu leur mise de départ. Ce logiciel apporte la sécurité financière fournie par la technologie « blockchain » « Ethereum ». Une « blockchain » est un ordinateur mondial unique, coordonné par des millions de PC ou téléphones. Une blockchain permet, entre autres, de générer une cryptomonnaie telle que bitcoin (bitcoin utilise sa propre blockchain). Dans le cas de la blockchain Ethereum, elle permet de sécuriser des contrats financiers complexes tels que les Social Impact Bonds. Ce logiciel est donc un « smart contract », c’est-à-dire un logiciel pour blockchain. D’où son nom de « Smart Impact Bond ». Cette entrée a été publiée dans blockchain, Ecrit en français, Entreprises responsables, Informatique, Innovation le 25/01/16 par Jean Millerat. Apprendre à coder, quelles solutions pour mes enfants ? Mes enfants ont 8 ans et 11 ans, garçons et filles (oui, j’ai des multiples…). Je tiens à ce qu’ils apprennent la culture et les bases du code informatique car je crois que le code modèle en partie la société et que ceux qui s’en sortiront le mieux seront ceux qui sauront « bidouiller » (hacker) la société et non ceux qui se feront bidouiller par elle. Bref. Comment leur donner les moyens et l’envie d’apprendre à bidouiller du code ? Après réflexion, examen des solutions populaires sur le Net et quelques tests avec mes enfants, en me basant également sur mes propres souvenirs d’enfance (j’ai commencé à coder à 8 ans), je crois que l’approche et les outils à privilégier dépendent grandement de l’âge. Et qu’il ne s’agit pas uniquement de choisir un langage de programmation pour en enseigner les bases mais plutôt de trouver un environnement d’apprentissage adapté à l’âge, motivant et ludique pour créer de l’engagement, du plaisir et de l’effort. En résumé, je pense que, jusqu’à 11 ans, l’environnement idéal est Scratch, ou les jeux blockly. De 11 ans à 14 ans, l’environnement idéal me semble Minecraft. Au-delà, des environnements plus « sérieux », probablement autour du langage python pourraient être plus appropriés. mais aussi en « mode débranché » pour découvrir l’algorithmie théorique, sans matériel informatique, avec du papier, un crayon, des allumettes, etc. Je me dis que ce qui manque aussi probablement, étant données les tendances technologiques de fond, ce sont des activités pour faire découvrir le machine learning aux enfants, les bases de la probabilité appliquée à la résolution automatisée de problèmes (raisonnement bayésien, etc.). ou bien les mécanismes de jeu qui, avec le bon scénario et la bonne plate-forme éducative, guident la progression des apprenants avec moins de dépendance à un animateur (donc de manière moins coûteuse en temps et en argent). Les mécanismes de jeu (le gameplay, règles, système motivationnel de quêtes et badges) et le scénario (imaginaire adapté et motivant) sont importants, mais la richesse visuelle du jeu importe presque autant (on ne refait pas nos vieux cerveaux…). Le fait de pouvoir changer le personnage d’un jeu en un petit panda a fait un gros effet (positif) sur ma fille… Presqu’autant que si elle avait pu le transformer en pingouin tux. Voici donc, en vrac, une sélection de ressources pour illustrer sur quoi s’appuient mes croyances actuelles. des bouquins réputés comme « Scratch pour les Kids : dès 8 ans ». Avec Minecraft, vous l’aurez compris, on est dans un environnement très immersif et très bidouillable alors pourquoi ne pas enseigner les mathématiques via Minecraft ? Avec des fictions interactives ? Les « Livres dont vous êtes le héro » (également appelés « Livres-jeux », « Choose Your Own Adventure », « CYOA » ou « gamebooks), sous forme numérique, sont des contenus interactifs qui permettent de visiter sous une forme créative et motivante des concepts simples d’algorithmie (branches conditionnelles, variables, voire conception objet), de programmation (compilation, exécution) mais aussi de design de jeu. Bien sûr, on peut faire une fiction interactive avec de simples liens hypertextes dans un wiki, mais les logiciels pour écrire les fictions interactives sont devenus très sophistiqués en s’inspirant des premiers jeux textuels en liens (les muds) et en introduisant donc des possibilités algorithmiques amusantes et créatives. Je n’ai pas cherché de proposition de progression pédagogique pour découvrir l’algorithmie à travers l’écriture de fictions interactives mais je suis à peu près sûr que ça existe. Cet angle de découverte de la programmation pourrait très bien convenir aux enfants les plus férus de lecture, d’écriture… et d’aventure. De nombreuses solutions logicielles très éprouvées et plus ou moins faciles à prendre en main existent pour créer des fictions interactives plus ou moins sophistiquées informatiquement. Parmi les logiciels de création les plus connus, on peut citer Twine, le vénérable Inform7, TADS, ADRIFT, ALAN mais aussi, avec un côté plus récent, squiffy et QuestKit. Il faudrait y regarder de plus près. Des bibliothèques en ligne permettent ensuite de partager et découvrir les créations, pour les lire et s’y plonger sur ordinateur ou sur smartphone. On peut aussi découvrir la logique algorithmique avec du matériel non informatique (papier, crayon, allumettes, …). On parle alors de découverte « débranchée » de l’algorithmie. Il existe des sites Web proposant des progressions ludiques pour apprendre la programmation. La plupart sont fondés sur des logiciels dits privateurs. Vous n’avez pas le droit de les utiliser comme vous voulez, de les étudier, de les partager, bref de les bidouiller, ce qui est un peu paradoxal. Mais l’avantage de ces plates-formes peut résider dans leur caractère « intégrée » : elles pourraient offrir une expérience ludique plus agréable et pédagogiquement plus efficace si elles accompagnent de A à Z les programmeurs en herbe. Mais au risque de disparaître corps et âme en cas de faillite commerciale. Quelques-unes de ces plate-formes utilisent du libre, mais ce ne sont pas forcément les meilleures pédagogiques. Code.org propose des progressions en français sous forme de sélection d’activités débranchées, de jeux algorithmiques et d’activités de programmation. C’est un peu la Khan Academy de la programmation : une association américaine à but non lucratif fait vivre cette plate-forme, à grands renforts de dons de Microsoft, Facebook et autres Google. Très Silicon Valley. Le code qui fait tourner la plate-forme est libre mais pas les contenus des activités pédagogiques qu’elle héberge. La richesse et la qualité des activités proposées semble pertinente. Hum… Pas mal. Codecombat.com vous embarque dans un vrai jeu vidéo pour apprendre à programmer, avec des contenus graphiques et sonores de qualité. Le joueur a le choix du langage de programmation qu’il veut apprendre (au moins au niveau de la syntaxe) : python, coffescript, clojure, … le choix est vaste. Et franchement, c’est du joli ! Ca donne envie de jouer et d’apprendre… A signaler encore quelques bugs et défauts de traduction en français. Blackvoxel est un jeu en logiciel libre, pour apprendre le C++, l’assembleur et le graphisme 3D. On dirait bien là un jeu pour apprendre à programmer des jeux « à la dure » plutôt qu’avec des progressions pédagogiques pour débutants. A réserver pour des lycéens ou des passionnés qui se seront déjà fait la main sur des langages et des environnements plus simples ? Blackvoxel semble proposer des modalités intéressantes pour impliquer un enseignant dans la progression de ses élèves-joueurs. Encore pour des lycéens (ou pour des grands collégiens, +13 ans), LiveCode propose une solution d’apprentissage du code pour développer des applis mobiles. Bon, voila pour mon petit tour du moment. Je suis surpris par la quantité de solutions proposées, y compris en français, et par la première impression très positive que me donnent certaines d’entre elles. Pour mes enfants, je compte explorer les pistes blockly mais surtout Minecraft car la communauté des modders Minecraft est tellement grande qu’il existe déjà tout un tas de réponses à des problématiques pédagogiques récurrentes. Par exemple, il existe des systèmes de gestion de quêtes dans Minecraft qui me semblent intéressantes. Et si je pouvais promettre 5 minutes de Minecraft de plus à celui de mes enfants qui fera la vaisselle demain soir ? ou à celui qui aura bidouillé avec succès tel ou tel aspect de notre vie familiale ? Et vous, vous en faites quoi de tout ça ? Cette entrée a été publiée dans Affaires non classees, Développement, Ecrit en français, Informatique, My wishlist, Open source le 02/11/15 par Jean Millerat. Fibromyalgie, qu’est-ce qui marche vraiment ? Un de mes proches souffre de fibromyalgie alors je m’interroge sur l’état actuel des connaissances scientifiques sur les traitements de la fibromyalgie : qu’est-ce qui marche vraiment ? y a-t-il des progrès récents et de nouveaux traitements à envisager avec des preuves solides et consensuelles ? Donc j’ai dégainé Google Scholar, à la recherche de méta-analyses et de revues systématiques de littérature au sujet de la fibromyalgie. Voici l’essentiel de mes découvertes. A noter que la traduction des résumés de ces publications (ou de leur conclusion) a été bâclée par moi avec l’aide de Google Translate donc des imperfections subsistent… En cas de doute, allez lire la publication scientifique d’origine. Ah, et puis un conseil pour commencer : s’intéresser à l’association Fibromyalgie France, contacter leur responsable local (départemental ou régionale) pour leur demander d’éventuelles infos (événements locaux, rencontres, forums, …) et notamment identifier s’il y a dans le coin des médecins rhumatologues (la fibro relève de leur spécialité, même si ça n’a rien d’un rhumatisme…) qui s’y connaissent bien en matière de fibromyalgie. Thérapies psychologiques : les TCC et les thérapies psychologiques et comportementales liées ont un effet faible à modéré dans la réduction des symptômes. Les TCC sont plus efficaces lorsque combinées à l’exercice physique. Exercice physique : l’exercice améliore le bien-être et le sommeil et peut réduire la douleur et la fatigue chez certains fibromyalgiques. En particulier, il y a des preuves fortes que l’exercice cardiovasculaire est efficace chez certains. L’exercice aquatique récurrent a des bénéfices prouvés car il combine exercice cardiovasculaire avec entrainement à la résistance. Antidépresseurs : un petit nombre de personnes tirent des bénéfices significatifs des SNRIs duloxetine et milnacipran et des anti-dépresseurs tricycliques (tels que l’amitriptyline) cependant de nombreuses personnes ressentent plus d’effets indésirables que de bénéfices. Médicaments anti-convulsifs : la gabapentine a des bénéfices significatifs chez 30% des patients. Cependant elle est fréquemment associées avec des effets indésirables. Opioïdes : la combinaison de tramadol et de paracétamol a une efficacité, une sécurité et une tolérabilité prouvées (pour des durées jusqu’à 2 ans) sans le développement de tolérance. Résultats intrigants : hormone de croissance humaine ? naltrexone à faible dose ? oxybate de sodium ? Résultats : 102 essais clinniques sur 14 982 patients et huit interventions actives (antidépresseurs tricycliques, inhibiteurs de recapture de la sérotonine, inhibiteurs de la sérotonine recapture de la noradrénaline (IRSN), acide butyrique analogique, prégabaline gamma-amino, exercice aérobique, balnéothérapie, thérapie cognitivo-comportementale (TCC), thérapie multi-composantes) ont été inclus dans l’étude. La plupart des essais étaient de petite taille et entravés par leur qualité méthodologique, l’introduction de l’hétérogénéité et l’incohérence dans le réseau. Lorsque restreinte aux grands essais avec plus de 100 patients par groupe, l’hétérogénéité était faible et les avantages pour IRSN et la prégabaline par rapport au placebo était statistiquement significatifs, mais faibles et pas cliniquement pertinents. Pour les interventions non pharmacologiques, un seul essai à grande échelle de la TCC était disponible. Dans les essais de taille moyenne avec ≥50 patients par groupe, la thérapie multi-composantes a montré des avantages faibles à modérés par rapport au placebo, suivie par l’exercice aérobie et la TCC. Conclusions : les avantages des traitements pharmacologiques de la FMS sont d’une pertinence clinique discutable et les preuves au sujet des bénéfices des interventions non pharmacologiques sont limitées. Une combinaison de la prégabaline ou de l’IRSN en tant qu’intervention pharmacologique et de la thérapie multi-composants incluant exercice aérobique et TCC en tant qu’interventions non pharmacologiques semble la plus prometteuse pour la gestion de la FMS. Conclusions: L’amitriptyline de TCA, la duloxétine et l’IRSN milnacipran sont des options de première intention pour le traitement de patients fibromyalgiques. Les médecins et les patients doivent être réalistes sur les avantages potentiels d’antidépresseurs dans FMS. Un petit nombre de patients éprouvent un soulagement notable des symptômes sans ou avec des mineurs des effets néfastes. Cependant, un nombre remarquable de patients abandonnent le traitement en raison d’effets indésirables intolérables ou ne ressentent qu’un petit soulagement des symptômes, ce qui ne l’emportent pas sur les effets indésirables. Duloxetine, recommandation consensuelle fondée sur des preuves de qualité 1A : les patients fibromyalgiques souffrant également de troubles dépressifs et/ou de troubles de l’anxiété devraient être traités avec de la duloxetine à 60mg/jour pour une période de temps limitée. Ce traitement peut également être envisagé pour des patients sans trouble dépressif ni trouble de l’anxiété si un traitement à l’amitriptyline n’est pas possible (par exemple à cause de contre-indications) ou bien ne fut pas efficace ou bien fut mal toléré. Prégabaline, recommandation consensuelle fondée sur des preuves de qualité 1A : Un traitement à prégabaline entre 150 et 450 mg/jour peut être envisagé sur des périodes de temps limitées si un traitement à l’amitritpyline n’est pas possible (par exemple à cause de contre-indications) ou bien ne fut pas efficace ou bien fut mal toléré. Inhibiteurs de la recapture de la sérotonine, recommandation consensuelle fondée sur un niveau de preuves de qualité 2A : Un traitement à base de SSRI, fluoxetine entre 20 et 40 mg /jour ou paroxetine entre 20 et 40 mg / jour peut être envisagée sur une période de temps limitée pour des patients souffrant également de troubles dépressifs ou de troubles de l’anxiété. Pas de recommandation (données insuffisantes pour trancher, nécessitent des recherches complémentaires) : gabapentine, inhibiteurs de la recapture de la noradrenaline, opioïdes faibles, aspirine, acétaminophène, metamizole. Conclusions des auteurs : Les TCC apportent un léger bénéfice incrémental par rapport aux traitements de contrôle pour réduire la douleur, les humeurs négatives et l’incapacité à la fin du traitement et lors du suivi à long terme. Les taux d’abandon pour une raison quelconque n’étaient pas différents entre les groupes de TCC et les groupes témoins. Un total de 7 études sur 117 avec 362 sujets et une médiane de 12 séances ont été inclus. Les thérapies méditatives ont réduit les troubles du sommeil, la fatigue, la dépression et amélioré la qualité de vie liée à la santé mais pas la douleur. Les effets significatifs sur les troubles du sommeil et la qualité de vie pourraient être maintenus au-delà de 4,5 mois après la fin du traitement. Dans les analyses de sous-groupes, seul le Yoga a abouti à des effets significatifs sur la douleur, la fatigue, la dépression et la qualité de vie à la fin du traitement. Le taux d’abandon en raison d’événements indésirables a été de 3,1%. Aucun événement indésirable grave n’a été signalé. Les thérapies méditatives sont sûres. le Yoga a eu des effets bénéfiques à court terme sur certains domaines clés de la FMS. Il y a un besoin pour des études de haute qualité avec des échantillons plus importants pour confirmer les résultats. Résultats : de nombreux traitements sont disponibles pour gérer la fibromyalgie, dont l’efficacité dispose de preuves de haute qualité. Ils incluent des thérapies non pharmacologiques (éducation, exercice, physique, TCC) et des thérapies pharmacologiques (tricycliques, inhibiteurs de la recapture de sérotonine norépinéphrine et les gabapentinoïdes). Conclusions et pertinence : la fibromyalgie les autres états de douleurs « centrales » sont bien mieux compris de nos jours que par le passé. La fibromyalgie peut être considérée comme un diagnostic à part enitère ou bien comme une constellation de symptômes caractérisés par une amplification de la douleur dans le système nerveux central, concomittamment à une fatigue, des problèmes de mémoire, des troubles du sommeil et des troubles de l’humeur. Des traitements efficaces de la fibromyalgie sont désormais possibles. Il n’existe pas de preuves scientifiques soutenant l’idée que des traumas physiques causeraient la fibromyalgie ; en particulier il n’existe pas de preuve (ou unique des preuves très faibles) que des accidents de la route pourraient causer une fibromyalgie. Dans certains cas rapportés dans les études sur le sujet, les effets précèdent même la cause. Les théories proposant que le trauma physique créerait un stress qui conduirait à une fibromyalgie sont non-prouvables et non mesurables. Nous pouvant supposer que les troubles du sommeil pourraient expliquer le développement de mécanismes anormaux de la douleur chez certains patients vulnérables. Nous savons que le seul de la douleur est significativement réduit en cas de réduction des ondes du seommeil lents et les études en IRM fonctionnelel ont montré une activité réduite dans certaines structures cérables liées à la douleur en particulier lors du sommeil lent. Des études de long-terme ont montré que des perturbations du sommeil peuvent être un risque majeur pour développer une fibromyalgie et des études polysomnographiques soutiennent l’hypothèse selon laquelle la fibromyalgie serait un trouble primaire du sommeil. Des architectures altérées du sommeil sont découvertes dans la plupart des études. Il existe des preuves que la fatigue du fibromyalgique est causalement liée aux troubles du sommeil. Suite au rétablissement du sommeil profond avec un traitement à base d’oxybate de sodium chez le fibromyalgique, la fatigue diminue ainsi que la douleur et d’autres symptômes. Les données actuelles soutiennent donc l’hypothèse selon laquelle la fatigue chronique et la douleur chronique chez le fibromyalgique résultent d’anomalies dans l’architecture du sommeil chez des patients psychologiquement vulnérables, ce qui conduit à un dysfonctionnement du système de régulation de la douleur. Ces données suggèrent que la gestion de la fibromyalgie devrait être multi-facettes. En plus des traitements physiques, comportements et psychologiques, les programmes de traitement doivent inclure une gestion active des pathologies du sommeil. 2015 : Fibromyalgie : où en est-on en 2015 ? Résumé : La fibromyalgie fait beaucoup parler d’elle et suscite encore débats et controverses en 2015. Pourtant, il n’est plus question de remettre en cause ce syndrome facilement reconnaissable (même si le diagnostic est aussi posé avec excès). Le modèle biopsychosocial permet de comprendre et de prendre en charge de façon plus globale toutes les maladies chroniques et évite la mise en échec des patients et des soignants. La fibromyalgie est un syndrome fréquent qui touche surtout les femmes qui rapportent des douleurs chroniques, diffuses, musculaires, tendineuses et/ou articulaires. Ces douleurs sont associées à des céphalées de tension, des troubles fonctionnels intestinaux, des symptômes génito-urinaires, des acouphènes, des douleurs de l’articulation temporomandibulaire, des paresthésies distales… On parle de troubles somatoformes, définis par des symptômes fonctionnels sans lésion tissulaire. Les critères diagnostiques de l’American College of Rheumatology (ACR 1990) se sont affinés en 2010–2011 et permettent désormais de mieux appréhender les symptômes dans leur globalité et leur sévérité. Les comorbidités émotionnelles et cognitives sont très fréquentes (troubles anxieux, dépression, catastrophisme, hypervigilance, manque de flexibilité, troubles de concentration et de mémoire…). La sensibilisation du système nerveux central est l’hypothèse physiopathologique la plus consensuelle. Les symptômes surviennent sur un terrain favorisant, apparaissent au décours de facteurs précipitants (éventuellement) et sont entretenus et/ou aggravés par des facteurs d’entretien. Différents traitements médicamenteux antalgiques classiques et psychotropes (antiépileptiques et antidépresseurs) ont montré leur efficacité. Des recommandations internationales actualisées sont disponibles. Elles font consensus sur la prise en charge qui doit être multimodale et faire appel à des traitements médicamenteux d’action centrale, associés à des approches psychophysiques et éducatives. L’éducation des patients, comme pour toute pathologie chronique, est donc indispensable. L’article complet peut être acheté pour 41,94 ¤. L’intérêt de cet article est qu’il est récent, en français et rédigé par 2 spécialistes français (sur Paris). Mais je ne l’ai pas lu et je ne sais pas ce que son contenu vaut. Et voila ! Merci Google Scholar ! Cette entrée a été publiée dans Affaires non classees, Ecrit en français le 17/09/15 par Jean Millerat. Quelles sont les méthodes et techniques pédagogiques qui marchent vraiment ? Quelles sont les méthodes pédagogiques qui marchent bien et celles qui marchent moins bien ? Qu’est-ce qui fonctionne réellement en pédagogie ? Comment savoir si une idée pédagogique est vraiment bonne ou mauvaise ? Où trouver des idées d’innovation pédagogiques qui ont des chances de faire plus de bien que de mal à nos apprenants ? Vous avez sans doute déjà assisté à ou lu des débats entre pédagogues, des débats sans fins, à coups de théories élaborées, des affrontements d’opinions, de croyances et de thèses difficilement vérifiables, bien souvent tranchés par l’invocation d’un grade (« c’est Monsieur l’inspecteur général qui l’a dit, c’est vrai ») ou d’une figure d’autorité historique (« c’est Piaget qui l’a dit, alors c’est vrai »), ou, plus souvent encore, jamais tranchés mais laissés en suspens de manière vaine au prétexte du relativisme ou des spécificités culturelles. Pour autant, au-delà des croyances et opinions de chacun, de quoi peut-on être sûr en matière d’éducation et de pédagogie ? Je m’étais posé ce genre de questions il y trois ans alors que je m’investissais professionnellement dans le secteur de l’éducation et j’avais eu du mal à identifier un « état de l’art » de qualité scientifique pour y répondre. J’ai un peu avancé cet été, voici ce que j’ai appris. solidité par la publication systématique des résultats expérimentaux (y compris les résultats négatifs) avec revue par les pairs..
Cette problématique de ce qui différencie un science d’un débat d’opinions est exprimée de manière très éloquente par Ben Goldacre dans sa présentation vidéo TED de 14 minutes sous-titrée en français. Ben Goldacre a ensuite proposé au ministère britannique de l’éducation une explication quant à ce que cette approche scientifique devait donner une fois appliquée au domaine de la pédagogie et de l’éducation. le site « Preuves de Haut Niveau » de la Coalition pour les preuves, devenue la division Innovation politique fondée sur les preuves de la fondation Laura et John Arnold, aux USA. Au final, j’ai trouvé peu de ressources en français sur l’éducation fondée sur les preuves. Et vous ? Cette entrée a été publiée dans Ecrit en français, Innovation le 28/08/15 par Jean Millerat. Dans l’univers de l’informatique, les méthodes de gestion de projet ont évolué au rythme de l’Internet. Les méthodes dites « agiles » sont venues enrichir la panoplie des chefs de projet de manière à réussir des projets à contexte incertains : ceux pour lesquels le besoin fonctionnel est difficilement connaissable ou bien susceptible d’évoluer. La méthode agile la plus pratiquée est probablement la méthode Scrum. Mais l’organisation du travail pronée par ces méthodes n’est pas uniquement pertinente pour la création de logicielle. Elle s’applique avec bonheur dans d’autres contextes de conduite de projet où l’incertitude sur les besoins métiers requiert de l’agilité et où les méthodes plus traditionnelles rencontrent leurs limites. C’est par exemple le cas dans ma pratique professionnelle dans le secteur de l’innovation technopédagogique. Or les méthodes agiles s’appuient sur des valeurs distinctes des méthodes traditionnelles. Ces valeurs sont résumées dans le « manifeste agile » mais avec des termes ancrés dans les pratiques du génie logiciel. Nous reconnaissons la valeur des seconds éléments, mais nous privilégions les premiers. Cette entrée a été publiée dans Ecrit en français, Innovation le 09/02/15 par Jean Millerat. 2014-06-09 : Un bon article introductif sur l’adaptive learning (abonnement gratuit nécessaire) rappelle que les bénéfices pédagogiques de l’adaptive learning sont parfois ambigüs et nécessitent des travaux complémentaires de recherche scientifique (via Modern Learners). 2014-06-04 : Une entreprise japonaise fournisseur de technologies d’apprentissage adaptatif s’associe avec le petit-fils de Jacques-Yves Cousteau pour proposer des cours d’océanographie gratuits (via Edukwest). 2014-06-03 : Les acteurs américains de l’enseignement privé continuent d’investir des dizaines de millions de dollars sur l’adaptive learning et élaborent des partenariats entre éditeurs de contenus et fournisseurs de technologie logicielle (via Inside Higher Ed). 2014-04-20 : Une autre bonne introduction générale sur l’adaptive learning : elle souligne que ces technologies en sont encore à leurs balbutiements et on ne sait pas encore lequel, parmi différents modèle pédagogique basés sur l’individualisation algorithmique des apprentissages, fera ses preuves et se développera de manière durable (via Distance Educator). 2014-04-13 : Le système éducatif actuel a été organisé pour l’instruction des masses à l’époque de la révolution industrielle. Il n’est plus adapté au fonctionnement de l’économie moderne. L’individualisation des apprentissages permise par les technologies logicielles d’apprentissage adaptatif pourrait être une solution pour remettre ce système en phase avec les besoins d la société d’aujourd’hui (via Distance educator). 2013-12-20 : Les entreprises américaines fournissant des technologies d’ « adaptive learning » continuent à lever des fonds importants mais la recherche scientifique ne prouve pas d’impact pédagogique spécifique pour ces technologies (via Hack education). 2013-04 : La fondation Bill et Melinda Gates finance la production d’un état de l’art en matière d’adaptive learning (via Ed Growth Advisors). 2013-03-21 : Les 2 acteurs qui accumulent le plus de données éducatives individuelles et de technologies de personnalisation adaptative sont Knewton (une entreprise) et la Khan Academy (une association non lucrative). Si l’enseignement (notamment supérieur) et la formation (notamment professionnelle) continuent à s’organiser sous la forme d’un espace mondialisé (marchand et de partage non marchand), alors ces 2 acteurs pourraient en devenir les leaders mondiaux et rompre définitivement l’équilibre économique des institutions éducatives traditionnelles (innovation « de rupture ») (via Forbes). 2013-02-19 : La personnalisation, c’est le coeur de la pédagogie. Les technologies de personnalisation éducative constituent « naturellement » une tendance majeure pour l’innovation technopédagogique depuis quelques années. (via Core-Ed). 2012-06 : La fondation Bill et Melinda Gates finance la création d’un institut universitaire non lucratif, à distance, grâce aux technologies d’apprentissage adaptatif (via la Gates Foundation). 2012-02-22 : L’Inde, pour faire face à son développement économique et à ses besoins croissants en formation doit construire 50.000 instituts universitaires et aurait besoin d’1 million d’enseignants supplémentaires. Pour faire face à l’ampleur de ces besoins, elle pourrait être tentée d’investir massivement dans les technologies logicielles d’apprentissage adaptatif en ligne (via Forbes). Ne nous y trompons pas : l’actualité sur l’adaptive learning s’accélère nettement ces derniers mois, mais nous sommes sur une tendance de fond et qui prendra encore quelques années avant de trouver sa pleine maturité économique, technologique et pédagogique. Cette entrée a été publiée dans Ecrit en français, Informatique, Innovation le 25/06/14 par Jean Millerat. J’ai un copain qui est un peu parano. Il a peur que la NSA, Apple, son opérateur télécom, le gouvernement ou un pirate malveillant ne le localisent. Faut dire qu’il a une vie amusante… Il va dans des endroits où il n’est pas censé aller. Il va voir des gens qu’il n’est pas censé voir. Alors forcément, le fait d’avoir son iPhone dans sa poche l’inquiète. Si il le laisse allumé, son téléphone va communiquer avec les antennes-relais autour de lui et il laissera des traces électroniques de son passage. Ca ne ferait pas bien sur son CV ou dans les journaux. Bien sûr, il y a le mode « avion » qui est censé couper toute communication entre son téléphone et l’extérieur. Le problème, c’est que mon copain, il n’a vraiment pas confiance dans la technologie. Et si son téléphone prétendait être en mode avion alors qu’il laisserait derrière lui des traces de petit poucet ? Pas moyen de faire confiance à un morceau d’électronique corrompu. Bien sûr, il peut carrément éteindre son téléphone. Mais, de nos jours, ce n’est pas parce qu’un écran est éteint qu’un téléphone est silencieux. Pas moyen de faire confiance à un écran. Si son téléphone n’était pas un iPhone, il pourrait toujours en retirer la batterie. Mais, même dans ce cas, les condensateurs dans le téléphone ne suffiraient-ils pas au vicieux téléphone pour, dans un dernier sursaut de malveillance, laisser UN petit caillou blanc mal placé qui le localiserait là où il n’est pas censé aller ? Bien sûr, il peut d’abord veiller à vider la batterie de son téléphone en le laissant allumé le plus longtemps possible puis en tentant de le rallumer plusieurs fois alors même qu’il s’était éteint faute de courant suffisant. Mais il reste au moins à l’iPhone suffisamment d’énergie pour dire qu’il ne lui en reste plus. Et si il est corrompu, rien ne dit qu’il ne lui en reste pas plus, juste suffisamment pour signaler son passage auprès d’une antenne relais. Bien sûr, il peut enlever la carte SIM de son téléphone. Il faut appuyer sur le micro-bouton sur la tranche de l’iPhone et retirer la carte SIM pour que celle-ci ne puisse plus l’authentifier sur le réseau. Mais cela suffirait-il à empêcher Big Brother et le téléphone corrompu à échanger un numéro de série auprès d’un antenne réseau mal placé ? Après tout, l’identifiant IMEI de son téléphone est justement là pour ça : pour permettre d’identifier un téléphone sans carte SIM sur le réseau. Alors l’absence de carte SIM ne suffit pas à le rassurer. Bien sûr, il peut se fier à Mère Nature et ses sacrées lois de la physique pour détériorer la performance de l’antenne du téléphone. Il peut, par exemple, envelopper son iPhone dans une feuille de papier aluminium en veillant à ce que la feuille touche bien la tranche métallique du boîtier (il faut enlever le téléphone de son éventuel étui). Ainsi, il devrait réussir à modifier l’impédance de l’antenne et diminuer la puissance (et la sensibilité ?) de celle-ci. Mais cela risque de ne pas suffire. S’il s’approche trop près d’une antenne relais, le signal risque de passer et sa paranoïa n’aura servi à rien. Bien sûr, il peut lire plus avant le texte des lois et créer un blindage électromagnétique (cage de Faraday) autour du téléphone pour bloquer toute communication. Pour cela, il doit enfermer hermétiquement son téléphone dans une boîte métallique. Etant données les fréquences de son téléphone (de 900 MHz à 5 GHz), peu importe le métal dont est constitué la boîte du moment qu’il conduit assez bien l’électricité : boîte en fer blanc, en autre type d’acier, en fer, en aluminium, en cuivre, en or, peu importe… Mais si les parties métalliques de son téléphone (ou, dans notre cas, le papier aluminium qui emballe son téléphone) viennent à toucher le métal de la boîte, celle-ci risque alors de se transformer en extension d’antenne et de relayer le signal au lieu de le bloquer. Bien sûr, il peut veiller à isoler électriquement le téléphone de la boîte en enveloppant téléphone et papier aluminium dans un étui en mousse ou en film plastique (épais si possible). Ainsi isolée électriquement, la boîte métallique peut faire blindage. Mais si sa boîte n’est pas suffisamment hermétique, le signal de son téléphone s’échappera et ses efforts n’auront servi à rien. Bien sûr, il peut veiller à la boîte soit hermétiquement close. En fait, la boîte peut avoir des trous de petit périmètre, ce n’est pas bien grave. Mais elle ne doit pas présenter de fente longue, de plaques disjointes entre elles, de fil ou prise qui entre ou sort de la boîte, et encore moins de couvercle mal ajusté ou mal posé sur la boîte. Puisqu’il faut ouvrir la boîte pour y mettre le téléphone, il y a forcément un couvercle ou une trappe. Ce couvercle, lui-même doit alors assurer un excellent contact électrique avec la boîte : pas de couvercle tordu, bosselé ou ne touchant la boîte que sur un demi-millimètre carré. Il doit toucher la boîte sur l’ensemble de son pourtour et la surface de contact entre le couvercle et la boîte doit être la plus grande possible, et sans peinture ni vernis. Les radio-amateurs ayant besoin de blindage utiliseraient souvent un pot de peinture vide et métallique car le couvercle (lui-même métallique) s’y ajuste hermétiquement et par contact métal sur métal. Mais si, malgré ses efforts, le couvercle n’est pas en contact électrique suffisant avec la boîte, ses efforts auront été vain. Bien sûr, il peut compléter le contact électrique entre la boîte et son couvercle en enveloppant ceux-ci dans du papier aluminium ou du rouleau métallique adhésif de plombier (à condition que la colle de l’adhésif ne soit pas isolante…). Avec un bon blindage électromagnétique, la puissance de son téléphone peut être atténuée de plusieurs dizaines voire centaines de decibels. Mais ces bestioles électromagnétiques sont tellement puissantes et sensibles que, si il passe à proximité immédiate d’un antenne relais (quelques mètres, voire quelques dizaines de centimètres), le blindage risque de ne pas suffire et le signal risque de réussir à traverser. Bien sûr, il peut multiplier l’efficacité du blindage en choisissant une boîte au métal épais : plutôt qu’avec l’épaisseur de métal d’une cannette de soda ou d’une boîte de conserve, il peut choisir une bonne vieille boîte en acier épais de 1 ou 2 millimètres et mutiplier d’autant l’atténuation permise par son blindage. Mais, vues les hautes fréquences utilisées par les téléphones, un pouième de millimètre d’épaisseur devrait suffire. à ce stade de paranoïa, il peut également brûler un cierge et faire une prière vaudou ou encore, plus simplement, laisser son téléphone chez lui ! D’ailleurs, si il veut tester l’efficacité de ces divers emballages, il peut d’abord y mettre son téléphone allumé et avec carte SIM, se mettre à proximité immédiate d’une antenne relais et essayer d’appeler son téléphone depuis un autre téléphone pour voir si celui-ci se met à sonner. Mais tout cela n’aura servi à rien si il a ignoré une règle de base de la sécurité informatique : la plupart des fuites d’information ne sont pas dues à des dispositifs numériques défaillants mais à des faiblesses bien humaines. Avait-il imaginé que la bonne amie à qui il allait ainsi discrètement rendre visite, une fois abandonnée par lui suite à un revers de fortune amoureuse, se consolerait dans les bras du cousin de la grand-mère du concierge d’un journaliste influent ? Et vous, que conseilleriez-vous à mon copain parano ? Cette entrée a été publiée dans Affaires non classees, Ecrit en français le 09/06/14 par Jean Millerat. How to test lean canvases in the optimal order ? I have portfolio of lean startup ideas or one startup idea but several versions for its lean canvas. And I have a limited capacity for testing these ideas. I can’t test all of them simultaneously and I wonder : which one should I start testing first ? which lean canvas should I start with ? First, let’s remember why we always start testing the most uncertain hypothesis when given one canvas. For your startup to be a success, all of the hypotheses in the canvas have to be tested and validated as true. Hence the cost of testing the whole canvas : it is the sum of the costs for testing each and every of its hypotheses. You test the canvas and test it further and cumulate testing costs. But if ever the hypothesis you just tested is false, you have to pivot and start again with a modified canvas, a new version of your canvas, or you have to put that project aside and further test another one. You therefore hope you start by testing a false hypothesis rather than a true one. You’d rather spend as low as possible before invalidating the whole canvas. By failing fast, you limit the cost of testing the whole canvas and you can start with an hopefully better version or give up with this project. In other words, you should try to pick the hypothesis which has the highest probability of being false. That’s the most uncertain hypothesis. You then multiply P and C and get P*C products from P*C=1*1 =1 to P*C=3*3=9 and start with the lowest P*C hypothesis. Now, let’s get back to my initial problem. I have a portfolio of lean startup ideas and have to pick the first one to be tested. Which idea should I pay the most attention to first ? Let’s calculate the probable cost for testing a whole canvas. This cost is not the sum of the cost of each and every hypothesis in this canvas because I may have to abandon this canvas as soon as one of its hypotheses is proven to be false. So the cost for testing a whole canvas is approximately equal to the cost for testing its most uncertain hypothesis, or its hypothesis with the lowest product of cost and probability. What is my collection made of ? Let’s say it’s a collection of several versions of a same project. On one hand you hope your first attempted canvas will be the right one so that you don’t spend time and effort testing bad versions. On the other hand you have to take the cost of testing into account and would prefer cheap tests to expensive ones. So your best version is the one with the best ratio of probability to cost. You want to maximize P / C.
For this comparison, let’s calculate PA/CA * CB/PB. Is it more or less than 1 ? In other words, you simply want to start with the most probable version and only take cost into account if you can’t make up your mind considering probabilities only. You then take the version with the cheapest first test. Assuming that the cost for testing hypotheses is of the same order of magnitude from project to project, you can consider V*P only and pick the project with the highest V*P value (unless your V*P values are similar and one of the first hypotheses has a surprising cost which you then have to take into account). Pick the project with the highest P*V value. In case of tied projects, restart steps 2 and 3 with these projects only and discriminate them. If you can’t make up your mind, go on with step 5 for each of the remaining projects and pick the one with the cheapest first test. Hopefully you selected one project. Rate the costs and probabilities of its 9 hypotheses, pick the one hypothesis with the lowest product of cost and probability (or further discriminate your best hypotheses by rating them once again). Hopefully your test was a success, meaning that you know your hypothesis was true (you should be surprised given it was the least probable in this canvas) or false (which still means the test was a success: this is validated learning). What to do now ? If the hypothesis is false, this canvas is invalidated and you have to pick another one. If the hypothesis is validated as true, this project just turned even more probable. But maybe your portfolio now contains new projects or this test gave you ideas for even more valuable versions of the canvas of this project ? So get back to step 1 ! Finally, what if your test takes a long time before validating or invalidating its hypothesis (e.g. you have to wait for an appointment or for the next season of activity) ? Which hypothesis to test next ? You should get back to step 1 but consider that the hypothesis which is still being tested still has the same probability but its cost is now null (or diminished by the amount of time and effort spent on starting its test and waiting for results). So the probability of its canvas is still the same as before but its cost is approximately the cost for testing its next hypothesis plus the cost for finishing the first test. That’s it. Now how do YOU proceed practically speaking for ordering your portfolio ? How do you optimize the ordering of tests in your portfolio of hypotheses without wasting time and effort and over-optimizing ? Cette entrée a été publiée dans Innovation, written in English le 20/04/14 par Jean Millerat. 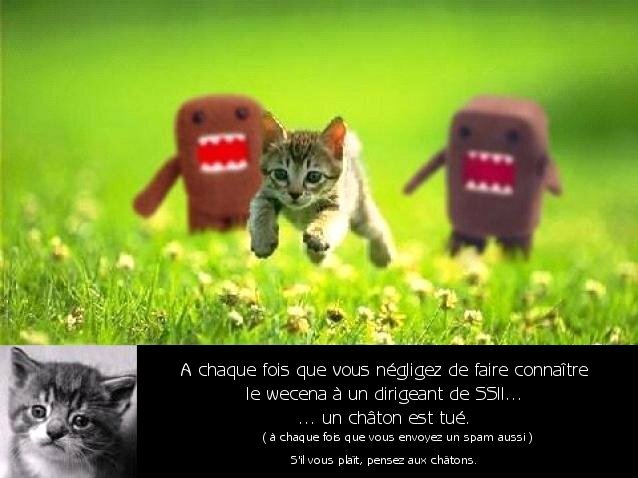 Pour éviter de vous noyer dans les photos de lolcatz et autres memes, le mieux est de personnaliser la page d’accueil en créant votre compte puis de vous abonner à des communautés intéressantes et de vous désabonner des communautés les plus polluantes. Voici ma sélection de communautés. Et vous, quels sont les reddits que vous trouvez les plus intéressants ? Cette entrée a été publiée dans Ecrit en français, Humains en réseaux le 15/05/13 par Jean Millerat. I have a deep interest in the lean startup method. One of the favorite tools of the lean startuper is A/B split testing. My favorite software package is Plone. Can Plone be used for A/B split testing without having to develop a specific python product ? The answer is probably yes. where « page » is the ID of the text field you set up above. What do we have now ? We have a form with a button. When the user clicks on the button, she is randomly redirected toward one the several « Thank You Pages » that you have defined. The redirection is based on the IP address of the user and her username if she is authenticated. The redirections are uniformly distributed against your destination pages. And they are recorded in the data record field. You A/B split test is not complete and several further steps must be taken before this is a fully operational solution but that was an enjoyable hack to make for me. Have fun with it and tell me how you would proceed with split testing and continuous deployment using Plone ! Cette entrée a été publiée dans Développement, Informatique, My hacks, Open source, written in English, Zope & Plone le 01/05/13 par Jean Millerat. Jose is a former colleague of mine (Motorola…), experienced business developer and social entrepreneur. His new startup LifeVenture.me has a mission. It « will make the wisdom of the world’s citizens searchable and actionable » by capturing the memories and wisdom of ageing persons on a tablet. You should check the video presenting his iPad app here. The topic of his new venture sounds very much exciting and I can relate to it. In a few days this month, my grandfather will be exactly 100 years old ! It will be a huge family celebration and he certainly will enjoy it even though he will claim he is in his 101st year now and we are one year late (as he always says at his birthday celebrations). He wrote his memoirs. My sister and my mother compiled them as a family book along with some pictures of him. We had it printed about 50 times and every family member got its book. We also regularly celebrate him with sorts of « derived » family products such as a tee-shirt with the portraits of his children, grand-children and grand-grand-children printed all over the back of the shirt. The daughter of my grandfather (i.e. my mother) has been building our family tree online for years. His other daughter (my aunt) tried to start a public writer freelance career lately. Her old customers want to have their memories written by means of her interviewing them and the audio then being transcribed and edited. My other grandfather died without written memories and his son (my father) and I do regret this. As a member of a somewhat large latin-styled family, I sometimes have discussions with my parents and relatives about how to best share the collective wisdom of our elders and build on it. But we haven’t found any convenient-enough solution. Writing memories and compiling memoirs is quite a hard and tedious process. It also sounds vain to some (hence possibly the reason why my other grandfather didn’t bother writing his). At first glance (I just watched the video and the iPad app has not been released yet), the process of filling the questionnaire sounds a bit tedious and a bit cumbersome. Especially given the fact that once it’s filled you can’t go back to it. I can guess this questionnaire may relate to the experience of Jose in the field of personal health records management. Couldn’t writing one’s memories rather be turned into an enjoyable and social or familial activity through some sort of gamified interviewing process ? Maybe it would give more opportunities to have conversations and visits from grand-children who would get a solid collective project to share with their ancestor. I remember having had cumbersome conversations with my now-gone grandmother on the phone. What to ask her beside how she feels (bad…) and how her day was (as the day before…) ? It also makes me think of these japanese community organizations where younger adults visit elders in the neighbourhood and ask them to make paper flowers which are then sold even though the price does not cover the cost of the visit and hide the real reason of this system : getting a solid excuse for multiplying social activities with some isolated ageing persons. Good excuses are important sometimes. Maybe the LifeVenture app would also give the opportunity to distribute all sorts of derived personalized products for the birthday or christmas of the ageing person or for family celebrations. Another business model option may also be to have the app act as some kind of controlled marketplace for « public writers » who would offer families the option of having memories recorded, transcribed and edited through the app. These writers may be living in developping countries and offer low cost services. Such a business model may also create jobs for people in the need, Samasource-styled. Interviews may be recorded and controlled in order to prevent abuse of older people. Interviewers may require some accreditation and privacy should be strictly enforced. Some more suggestions for entrepreneurs such as Jose, from my recent experience founding Wecena and then at the Cned innovation department : has he heard about the « lean startup » movement ? he must have. Did he take 30 minutes to write down his business assumptions under the form of a business model canvas ? He should have. Does he start his new venture by validating his assumptions about customers problems before building his iPad app ? He most probably should. Does he try to get pre-sales for his app before building it ? He should. Does he read Steve Blank’s blog ? He should ! Did he follow the Lean Launchpad MOOC and buy Steve Blank’s Startup’s Owner Manual ? He may find them much useful even as the experienced entrepreneur and business developper he is. You’ve got it : I am now a big fan of Steve Blank’s take on how to search for a valid business model. I sincerely regret not having known this when I launched my 2nd startup 4 years ago. Maybe my love for the Lean Startup hype is making me blind and won’t last long. I don’t think so but time will tell. Meanwhile I’d be more than happy hearing from Jose on such topics. Jose, let’s have a call soon so that I can share with you my enthusiasm about your project ! See you soon, Jose ! Cette entrée a été publiée dans Humains en réseaux, Innovation, written in English le 07/04/13 par Jean Millerat. vers du wecena 2.0 ? 64 informaticiens ont fait du wecena pendant leur intercontrat depuis notre démarrage il y a 4 ans, pour un total d’environ 700 jours.hommes de prestations numériques au profit d’associations dédiées à l’accessibilité (handicap), l’éducation ou l’insertion sociale. C’est bien. Mais c’est loin d’être assez. C’est notamment insuffisant pour continuer à faire bouillir la marmite familiale et je ne peux tout simplement pas continuer à en vivre. Il me faudrait au moins 3 équivalents-temps-plein de contributeurs en intercontrat pour être à l’équilibre. Cet équilibre a été atteint et dépassé au premier semestre puis 2 des 3 SSII mécènes les plus importantes ont suspendu leurs envois de nouveaux contributeurs et ne reprennent que petit à petit. Depuis début 2012, je tourne à 1 équivalent-temps-plein, soit une rémunération d’un tiers seulement de ce qui est nécessaire pour ma famille. Du point de vue chiffres, il est temps de tirer une conclusion : le wecena est un échec. Le wecena est un modèle économique innovant et compliqué. Il nécessite un effort d’éducation des SSII que j’avais sous-estimé. Je tablais sur des délais de vente initiaux d’environ 9 mois à 1 an (classique pour de la vente de service en B2B) mais, bien souvent, il a fallu entre 18 mois et 2 ans entre la rencontre initiale avec la SSII (« Le wecena ? J’ai compris, quelle bonne idée ! Ça va motiver nos salariés et ça ne va pas nous coûter grand chose ! ») et le premier contributeur en intercontrat effectivement mobilisé pour une association. Bien souvent, mon interlocuteur à la communication ou aux RH doit convaincre son comité de direction et ce n’est pas choses facile. Sur des aspects plus techniques, comme par exemple le calcul des économies d’impôts permises par le mécénat, la plupart des SSII vérifient le calcul avec moi et se l’approprient. Mais j’ai été surpris dans 10% des cas, de rencontrer des « comptables » d’entreprises (internes à l’entreprise et non des cabinets d’expertise comptable) qui n’arrivaient pas à comprendre comment calculer correctement l’économie d’impôts sur les sociétés permise d’une part par un don en nature (avec perte de déductibilité des charges faisant l’objet du don) et d’autre part par un don en numéraire (pour laquelle l’impact de la réintégration extra-comptable est nul puisqu’il s’agit de donner une part de bénéfices qui sont imposés dans tous les cas, avec ou sans don). Les entreprises françaises ne sont pas habituées au mécénat. Elles sont encore moins habituées au mécénat de compétences. C’est encore moins le cas dans le secteur des SSII. Et lorsqu’il s’agit de calculer quel montant d’économie d’impôts peut être consacré au financement d’un projet, certains contrôleurs de gestion ou chargés de comptabilité s’arrachent les cheveux. C’est compréhensible. La RSE et le mécénat ne sont pas une urgence pour les SSII. Lorsque le wecena est mis à l’ordre du jour du comité de direction, c’est en tout dernier item sur la liste et il est donc reporté de CODIR en CODIR… Quand la décision est prise, les choses trainent, le passage à l’acte souffre d’autant plus de l’inertie de l’organisation que la conduite de ce changement ne revêt aucun caractère d’urgence pour le business : RH, image, éthique, convictions personnelles, les enjeux sont trop « soft » et pas assez cash. Le wecena est relégué sur la voie des véhicules lents. Aux yeux du business, la moindre affaire sera toujours plus urgente que l’optimisation des intercontrats (à moins que celle-ci ne rapporte du cash, mais c’est une autre histoire). La RSE et le mécénat sont parfois réduits à un outil de communication corporate. Pour pouvoir communiquer sur sa RSE, il suffit parfois de recueillir un témoignage de salarié, inutile d’en mobiliser 100 sur l’opération. Il n’y a pas besoin de s’engager sur du volume, ou de faire bouger son entreprise pour mobiliser un grand nombre de salariés. Communication corporate ne rime pas avec volume, valeur économique et impact social. Donc une fois qu’un contributeur a été envoyé sur un projet (voire même avant), la SSII communique publiquement sur son engagement et ne se sent pas vraiment obligée de traduire son engagement par du volume ou de la régularité. Ce n’est pas de l’engagement sérieux. Un projet RSE qui ne rapporte pas de cash a une valeur quasi-nulle pour les dirigeants de SSII. De nombreuses SSII ont refusé de faire du wecena au motif que le mécénat ne rapporte d’argent immédiatement : le mécanisme fiscal est utilisé pour financer la formation et l’encadrement des contributeurs en intercontrat, pas pour être encaissé par l’entreprise mécène. L’utilité sociale auprès des personnes démunies n’a pas de valeur pour la plupart des dirigeants de SSII. Pire, les bénéfices qu’en tirent sa société sur le plan de la gestion des ressources humaines (motivation des salariés, fierté d’appartenance, …) sont négligeables pour la plupart d’entre eux. Les dirigeants les mieux renseignés au sujet du développement durable et du concept de « triple bottom line » argumentent : » Si le mécénat ne rapporte pas d’argent, c’est qu’il ne s’agit pas de développement durable puisqu’il ne produit pas un impact positif sur la bottom line financière » et en concluent : » On veut bien faire du wecena, mais uniquement si ça rapporte du cash ». Autrement dit : » Si le wecena ne nous rapporte pas de cash, ça ne nous intéresse pas, et ce même si ça ne nous coûte rien. » Au final, seuls les plus convaincus acceptent d’en faire. Mais un peu trop « à la légère » pour la plupart d’entre eux. Convaincre une SSII de faire du mécénat, ça ne suffit pas à la convaincre d’en faire beaucoup et régulièrement. Il y a celles qui en font « pour la communication » et se satisfont donc d’un maigre volume. Et il y a celles qui en font « pour les RH » mais, même dans ce cas, la frustration des porteurs RH est grande devant l’incompréhension et le manque d’enthousiasme et d’attention des dirigeants commerciaux. Dans le secteur de sous-traitance qu’est celui des SSII, la culture commerciale l’emporte largement sur celle du développement des ressources humaines. Et même quand le comité de direction est enthousiaste et partant, le moindre coût de Trafalgar sur le business met le mécénat en danger : ce n’est pas une priorité et ça passe à la trappe si le RH a d’autres soucis à gérer pour un temps. Le mécénat est la dernière roue du carrosse, juste après les RH vus comme centre de coût voire comme un luxe inutile. « Faire de la RSE » en soi ne suffit pas, « occuper utilement les intercontrats » non plus, rendre ses salariés heureux ou fiers d’eux-même ou de leur société est un luxe. Ce qui freine la RSE, ce n’est pas son coût mais la difficulté à en percevoir et à en communiquer la valeur aux parties prenantes. Dans ce contexte, le modèle économique du wecena est trop compliqué. Ce DG de SSII l’avait bien compris : » Monsieur Millerat, j’ai beaucoup de sympathie pour votre projet ! » me dit-il tout sourire en me confiant une coupe de champagne lors du cocktail d’assemblée générale de Syntec Numérique. Plusieurs mois après, une responsable RH de sa société m’avoue : » Nous avons bien compris que le coût du wecena est remboursé par des économies d’impôts. Mais, finalement, nous ne ferons pas de wecena car, même si cela ne nous coûte rien, notre DG serait alors obligé d’expliquer à la maison mère pourquoi notre résultat avant impôts a baissé même si cette baisse est compensée à 100% par l’économie d’impôts. Les échanges avec la holding corporate sont déjà assez compliqués comme ça, notre ‘bande passante’ est limitée, on ne va pas ajouter le wecena en plus, les actionnaires ne prendraient pas la peine de comprendre. De plus, comme les bonus de nos managers sont indexés sur notre résultat avant impôts, cela nous obligerait à expliquer à nos managers pourquoi nous modifions la définition de leur bonus et donc pourquoi nous faisons du wecena. Le jeu n’en vaut pas la chandelle… « . Le wecena, même si il ne coûte rien en soi, revêt un caractère d’engagement social de toute l’entreprise et de toutes ses parties prenantes. Dans une culture dominante éloignée de l’innovation sociale, la communication sur le wecena risque soit d’être insuffisante et donc inefficace, soit trop coûteuse car le message serait trop éloigné des réalités et réflexes habituels de l’entreprise qui n’est pas habituée à ce genre d’initiative. Une forte proportion des grosses SSII ne paie pas d’impôts sur les sociétés. Même bénéficiaires, les grandes entreprises ont tiré partie de règles fiscales leur permettant d’éviter l’impôt sur les sociétés. Il s’agit notamment des mécanismes de report de déficit : si une société avait un gros déficit une certaine année, elle pouvait reporter son déficit pour compenser les bénéfices des années suivantes et, ainsi, ne jamais avoir d’impôts sur les sociétés à payer jusqu’au moment où ses bénéfices excèderaient largement les déficits des années passées. Le montage contractuel du wecena est trop compliqué : une convention de mécénat entre chaque SSII et chaque association, ça fait beaucoup de paperasses, des négociations contractuelles parfois disproportionnées en temps (au regard du volume des dons obtenus par la suite), des délais de gestion administratives, des reçus fiscaux et des flux financiers qui se multiplient. Conclusion pour faire au plus court : le wecena version 1.0 est trop compliqué et pas assez stratégique. suspendre le remboursement de mes 2 prêts Antropia : l’incubateur social Antropia m’avait permis de financer cette phase de vente initiale aux SSII qui s’était avérée plus longue que prévue, grâce à un prêt d’honneur à Wecena SARL. L’activité n’est pas suffisante pour continuer à rembourser. Antropia m’aide à trouver la meilleure solution pour la suite. poursuivre le wecena au quotidien : plusieurs SSII continuent à jouer le jeu, malgré toute la frustration que je peux ressentir au vu du faible volume d’engagement, et leurs salariés contributeurs continuent à s’activer au quotidien de manière extrêmement utile et appréciée auprès des associations de solidarité. Il faut donc continuer à les accueillir, les former, les encadrer, assister l’association bénéficiaire dans la conduite des projets. Je continue à m’en charger : pour le flux actuel de 1 équivalent-temps-plein, ça me prend environ 2 demi-journées par semaine, réparties entre les mêlées téléphoniques qui ont lieu entre midi et deux, et les travaux du soir, sans compter que mon nouvel employeur accepte que je consacre quelques jours de congés sans solde à cette période de transition. Des amis consultants sont prêts à prendre le relais dans ce rôle d’assistance à la conduite de projets agiles et à distance. Pour moi, il s’agit également de maintenir en conditions opérationnelles la plate-forme wecena.com et de continuer à l’exploiter pour la production des reçus fiscaux et des éléments de reporting nécessaires aux associations et aux SSII. Voila, voila. Vous l’aurez compris, c’est la crise aussi pour le wecena. Le wecena se poursuit malgré tout et, tant qu’il reste des SSII prêtes à remonter les manches de leurs salariés pour les faire contribuer à des projets de solidarité, le wecena continuera à exister. Le fait de reprendre un boulot de salarié me permet d’envisager avec plus de sérénité l’avenir du wecena (je n’ai plus le couteau sous la gorge), cela se traduira peut-être par un rythme d’évolution plus modeste, mais cela se traduira sans doute également par une plus grande ouverture et l’implication d’un plus grand nombre de partenaires. Qu’est-ce que tout cela vous inspire ? À vous lire ! Cette entrée a été publiée dans Ecrit en français, Entreprises responsables, Humains en réseaux, Informatique, Innovation, le wecena, Mécénat, My wishlist le 31/03/12 par Jean Millerat. Mobilisez votre réseau d’amis pour une association de solidarité et partagez jusqu’à 20.000 EUR de chèques cadeaux bios, solidaires et équitables. L’entreprise sociale Wecena offre des chèques cadeaux aux personnes qui s’inscrivent sur son site, invitent leurs amis à s’inscrire à leur tour, jusqu’à ce qu’un ami d’ami d’ami (etc.) réussisse à convaincre un informaticien d’offrir au moins 2 jours de travail gratuit à une association de solidarité Wecena. Les associations soutenues par Wecena ½uvrent dans le domaine du handicap, de l’éducation et de la lutte contre la pauvreté. Plus vos amis d’amis d’amis (etc.) réussissent à convaincre des informaticiens d’aider les associations dans le cadre du wecena, plus vous et votre réseau d’amis gagnez de cadeaux. Ces associations ont besoin de compétences numériques, elles ont besoin de vos réseaux. À chaque fois qu’un nouvel informaticien offre 2 jours de travail gratuit à l’une des associations dans le cadre du wecena, sa chaîne d’amis partage 200 EUR de cadeaux ! Faites bouger des informaticiens et recevez vos cadeaux… Inscrivez-vous en cliquant sur le lien envoyé par votre ami, recevez votre propre lien puis offrez-le à vos amis ! Cette entrée a été publiée dans Ecrit en français, Humains en réseaux, Informatique, Innovation, le wecena le 05/03/12 par Jean Millerat. Quand on est décideur politique, entrepreneur social ou financeur d’innovations sociales (fondations,…), on aimerait bien savoir si l’innovation sociale ou la politique publique que l’on décide de financer ou de mettre en ½uvre sera réellement utile ou non pour la société. Par exemple, si je promets un sac de lentilles gratuit à toute famille africaine qui vient au dispensaire pour faire vacciner son enfant, est-ce qu’il y aura plus d’enfants vaccinés que si je ne fais pas cet effort ? Cet effort en vaut-il la peine ? Alors on recourt souvent à des hypothèses contestables et peu solides sur « ce qui se serait passé si mon innovation sociale n’avait pas été mise en ½uvre » et sur « ce qui, maintenant que mon innovation sociale existe, contribue à produire le même effet ou à le renforcer ». Comme les historiens qui cherchent à identifier la cause d’un événement, on essaie de faire preuve d’imagination et on formule des hypothèses peu solides car difficilement prouvables : » Et si mon innovation n’existait pas, que se passerait-il ? ». Malheureusement, la méthode SROI a un niveau de complexité tellement inhabituel pour le champ de l’innovation sociale, que ces hypothèses au c½ur de la méthode restent souvent cachées, réduites à un 1 ou 2 ratios rapidement posés dans un coin du calcul et sont rarement contestés par les décideurs et financeurs, déjà impressionnés de voir que tel innovateur a mis en marche une telle méthode aux apparences de rigueur scientifique… Bref, le SROI, c’est très bien et généralement vertueux, c’est assez bluffant et utile, mais c’est loin d’être parfait. Alors comment aller plus loin ? Et comment prouver que le projet que l’on promeut (distribuer des sacs de lentilles) est bien la cause que l’on peut attribuer à l’effet que l’on promet (avoir plus d’enfants vaccinés) ? Pour pouvoir prouver la cause réelle de l’effet attendu, il est préférable, et souvent indispensable, de mettre en place une expérimentation randomisée en double aveugle, comme le promeut par exemple le Poverty Lab d’Esther Duflo. C’est le même genre de problème, et de rigueur expérimentale nécessaire, que dans le domaine médical où l’on veut être sûr de l’impact d’une nouvelle thérapie avant de la mettre sur le marché. Et ces situations posent aussi des problèmes éthiques et de relations publiques : allez-vous priver « pour la science » des enfants d’une chance supplémentaire de se faire vacciner en décidant que leur famille ne se verra pas motivée par un sac de lentilles ? Allez-vous laisser mourir des enfants du « groupe témoin » pour pouvoir prouver que votre sac de lentilles est vraiment efficace et aurait pu les sauver si vous aviez été moins rigoureux ? Un raisonnement éthique bien posé devrait permettre de trouver rapidement la réponse. Mais ce raisonnement n’en reste pas moins difficile à communiquer. Une solution nouvelle à ce problèmes semble émerger d’une théorie mathématique appelée la théorie du calcul causal, en probabilité. En effet, cette théorie permet, dans certains cas, de « remplacer » de manière tout aussi rigoureuse l’étude randomisée en double-aveugle par l’étude statistiques de données supplémentaires. Cette théorie aide à déterminer quels sont les indicateurs qui, si ils sont mesurés dans la situation actuelle (donc sans expérimentation randomisée en double aveugle), permettent par le biais de calculs, de démontrer l’efficacité d’une intervention. C’est presque magique, l’application de cette théorie permet de répondre de manière rigoureuse à des questions du type » Que se serait-il passé si ces personnes avaient été privées de mon innovation ? » ou bien, à l’inverse, « Que se serait-il passé si ces personnes avaient été forcées à bénéficier de mon innovation ? ». Le prix à payer réside dans la nécessité de devoir formuler des hypothèses plus précises sur la manière dont la cause promue (le projet, l’intervention, l’innovation, le sac de lentilles) produit l’effet promis (l’impact social, le nombre d’enfants vaccinés), par exemple par quelles étapes intermédiaires la cause produit son effet. Et ces hypothèse peuvent à leur tour être contestées. L’autre prix à payer, c’est qu’il faut mesurer un plus grand nombre d’indicateurs, correspondants aux hypothèses supplémentaires qui ont été formulées. Enfin, la théorie du calcul causal ne s’applique pas à tous les cas de figure. Mais l’avantage est énorme : pas besoin d’expérimentation ! Je découvre tout juste cette théorie et je ne saurais pas la mettre en ½uvre. D’ailleurs, je ne pense pas qu’elle ait déjà été mise en pratique par qui que ce soit dans le domaine de la mesure d’impact social (si ?). Mais quelle formidable découverte si elle permet, par l’analyse de données (vive l’open data), de s’économiser la mise en ½uvre d’une procédure expérimentale coûteuse, longue et à l’éthique parfois douloureuse. Vivement que des chercheurs et des ingénieurs puissent outiller cette théorie et en faire bénéficier le champ de l’entrepreneuriat social ! NB : au passage, j’ai découvert le paradoxe de Simpson (rien à voir avec Bart) qui démontre combien notre intuition interprète mal la signification des probabilités. Cette entrée a été publiée dans Ecrit en français, Humains en réseaux, Innovation, My wishlist le 26/01/12 par Jean Millerat.